The ORID® 70-C will indicate the material composition of 100, 200, 300 and 400 series O-Rings of 60 to 80 Durometer which are already known to be either Viton®, Kalrez®, Nitrile or EPDM. The ORID itself is a tube with a controlled or specific weight inside it. The weight falls a controlled distance. To determine an o-ring’s rubber compound, place the o-ring on a stable table or surface. 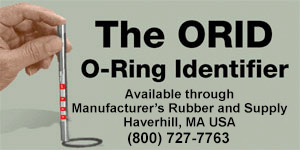 Place the ORID® over the o-ring and raise the weight all the way to the top of the tube (as far as it will go). Release the weight and let it drop onto the o-ring. It will bounce. The height of the first bounce will rise to one of the four calibrated ranges. The highest is EP (Ethylene Propylene). The next is Nitrile. The next is Kalrez®. The lowest graduation is Viton®. This indicates your rubber compound. Highest Graduation — EP ethylene propylene O-Rings are compatible with most water-based chemicals from 70 º F to +300 º F.
Third Graduation — NITRILE. Also, known as Buna-N. These O-Rings are good for most plumbing applications from -30 º F to +225 º F.
The results obtained through the use of this device have been consistent and repeatable in our evaluations. However, since a degree of user technique is required we cannot be responsible for specific results. For more information, contact your trusted rubber products manufacturers today!